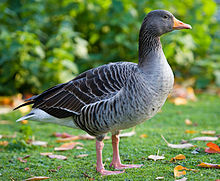 The greylag goose (Anser anser) is a species of large grey goose in the waterfowl family Anatidae. It is the largest goose. Its distribution is widespread. Birds from the north of its range in Europe and Asia migrate south to spend the winter in warmer places. It is the type species of the genus Anser and is the ancestor of the domestic goose. It has been domesticated at least since 1360 BC. The genus name is from anser, the Latin for "goose". Greylag geese travel to their northerly breeding grounds in spring, nesting on moorlands, in marshes, around lakes and on coastal islands. They normally mate for life and nest on the ground among vegetation. A clutch of three to five eggs is laid. The female incubates the eggs and both parents defend and rear the young. The birds stay together as a family group, migrating southwards in autumn as part of a flock, and separating the following year. During the winter they occupy semi-aquatic habitats, estuaries, marshes and flooded fields, feeding on grass and agricultural crops. Some populations, such as those in Southern England and in urban areas, are resident and occupy the same area year-round. ↑ Jobling, James A (2010). The Helm Dictionary of Scientific Bird Names. London: Christopher Helm. p. 48. ISBN 978-1-4081-2501-4. This page was last changed on 10 September 2018, at 10:24.